A revised and updated second edition of American Heart Association's beloved, bestselling Healthy Slow Cooker Cookbook, now with 30 new recipes, 30 to 40 new photographs, and full-color throughout. Now fully illustrated throughout with 30 to 40 new photographs, revised to meet current AHA guidelines, and refreshed with recipes like Chicken Pho, Pad Thai, Sweet Potato Chili, and Beef Vindaloo to satisfy today's palate, this comprehensive cookbook offers information on the health benefits of slow cooking and how a slow cooker can help you eat well. 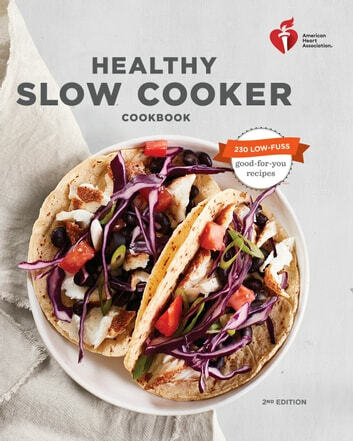 From appetizers to desserts and everything in between, the 230 recipes in American Heart Association Healthy Slow Cooker Cookbook will surprise you with their variety and depth of flavor. The slow cooker, America's favorite kitchen appliance, has become increasingly versatile and sophisticated, and here's how it can support a heart-smart diet. Under the spell of its low heat, lean meats, whole grains, legumes, vegetables, and fruits transform into succulent meals. This cookbook takes advantage of the ease for which the slow cooker is beloved and optimizes the nutrient density and flavors in these delicious, nutritious meals. The best way to ensure good food comes out of your cooker is to put only good-for-you ingredients into it, and with American Heart Association Healthy Slow Cooker Cookbook, you'll learn how much your slow cooker can do for you while you're enjoying a healthy lifestyle.